It’s certainly plausible! Why? On Earth, each of these things has something in common, that Mars also has: volcanoes. Gold, like all elements in the periodic table heavier than iron, is formed exclusively when very large stars explode at the end of their lifetimes. The entire Earth’s reservoir of gold is the collected remains of these explosions, created well before our solar system formed. All the gold present on our planet was present in the cloud of dust and gas that eventually collapsed into our solar system. The early solar system spent a reasonably long time in a “molten protoplanet” phase, where the objects which would eventually become planets had yet to form a solid crust. Most of the metals collected in the core of the planets; this stage was the origin of the nickel-iron core of our planet. (I happen to like the nickel-iron core, since its motions are also responsible for our protective magnetosphere.) Any gold present while this settling process was going on would also have sunk towards the center. Clearly we still manage to find gold on the surface of our planet, so we haven’t lost all of the gold to the fiery depths of our planet. Mars has a set of volcanoes on its surface that contains the largest volcano in the solar system, Olympus Mons. These volcanos resemble the large shield volcanoes on earth (the islands of Hawaii, for instance) so it seems reasonable to suggest that many of the processes that we can see happening on Earth near our volcanoes might also have been present in the ancient, volcanically active Mars. This redepositing of gold on the surface or near the surface may well have also happened on Mars. 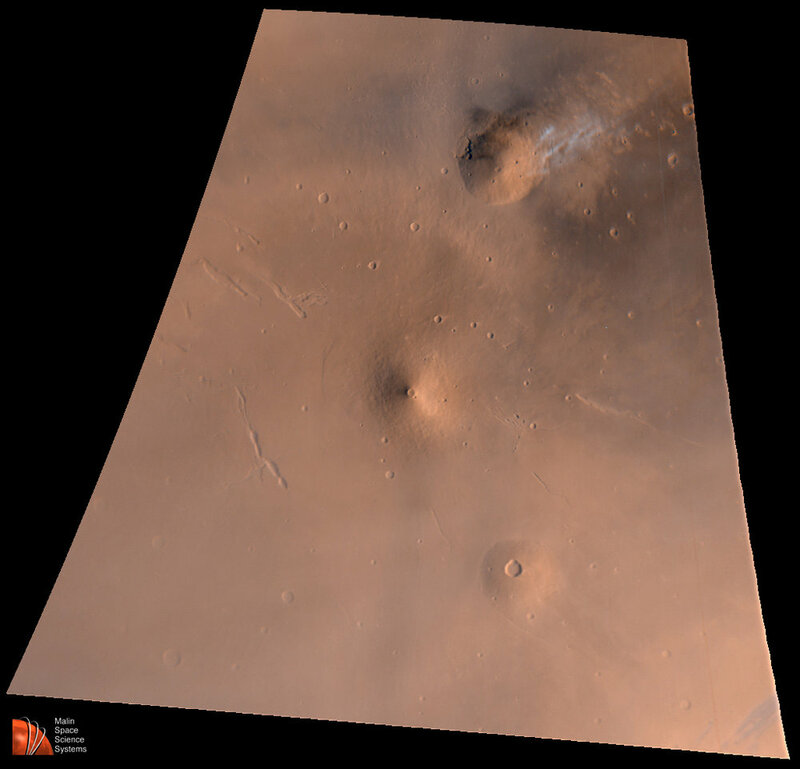 Volcanic Region, Mars Elysium Volcanic Region View, By Mars Global Surveyor's Camera (Note Bright Clouds). Image credit: NASA. What about geodes? Geodes are hollowed out bits of rock, with crystals growing on the inside. The fundamental requirement is to have the hollow present, so that the crystals can grow inside of it. Volcanoes can come to the rescue here as well. The smooth-flowing type of lava frequently creates little bubbles; sometimes these bubbles pop, but sometimes they harden in place. If the bubble survives, over time, water may be able to seep inside, depositing minerals, which can form crystals. We know now that Mars had plenty of water at one point, so this process may also have been possible on Mars. Agate? Agate also has a volcanic origin. Agate forms when material full of silica (the main ingredient in white sand, and glass) slowly fills or partially fills an irregular hole, perhaps formed by a gas bubble in lava. As the material fills in the hole, it creates the bands you see in some agate, like a tree growing produces bands as it grows. However, we’ve already found a number of interesting minerals on Mars where we have landed rovers! Opportunity found a huge streak of gypsum sticking out of the surface of Mars, and also found hematite ‘blueberries’ – a sign of a wetter past on Mars. Even more minerals have been detected from orbit! But until we can crack some more of the problems with more closely exploring the more volcanic regions of Mars, the presence of gold, agates and geodes on Mars will remain simply plausible! Sign up for the mailing list for regular updates in your inbox! Why don't black holes grow faster?